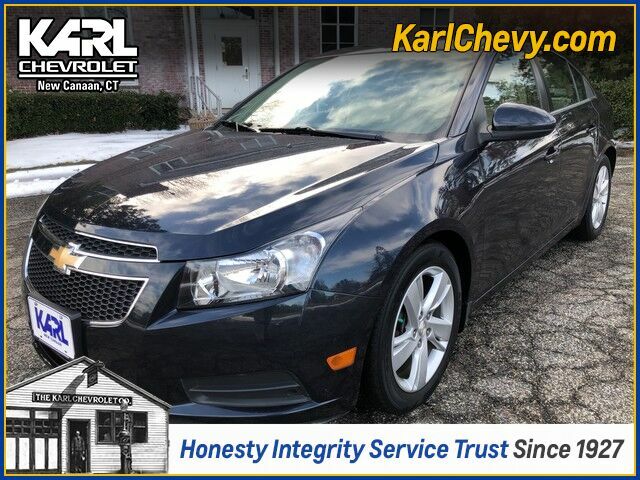 This Certified Pre-Owned 2014 Chevrolet Cruze Diesel LT is offered to you for sale by Karl Chevrolet. This one-owner local trade is loaded with features including Heated Leather Seats, Navigation, Remote Start, Bluetooth, Rearview Camera, Alloy Wheels and much more. Low miles, well maintained and ready to go including the Chevrolet CPO Warranty and complimentary maintenance plan. Another outstanding value from Karl Chevrolet. This Chevrolet includes: PREFERRED EQUIPMENT GROUP REAR VISION CAMERA Back-Up Camera 2LT/DIESEL DRIVER CONVENIENCE PACKAGE Driver Vanity Mirror Passenger Vanity Mirror Power Mirror(s) Auto-Dimming Rearview Mirror Back-Up Camera Heated Mirrors Passenger Illuminated Visor Mirror Driver Illuminated Vanity Mirror TRANSMISSION, 6-SPEED AUTOMATIC, ELECTRONICALLY CONTROLLED WITH OVERDRIVE (STD) A/T 6-Speed A/T COCOA/LIGHT NEUTRAL, LEATHER-APPOINTED SEAT TRIM Leather Seats LICENSE PLATE BRACKET, FRONT EMISSIONS, CONNECTICUT, DELAWARE, MAINE, MARYLAND, MASSACHUSETTS, NEW JERSEY, NEW YORK, OREGON, PENNSYLVANIA, RHODE ISLAND, VERMONT AND WASHINGTON STATE REQUIREMENTS BLUE RAY METALLIC MIRRORS, OUTSIDE HEATED, POWER-ADJUSTABLE, BODY-COLOR, MANUAL-FOLDING Power Mirror(s) Heated Mirrors AUDIO SYSTEM, CHEVROLET MYLINK RADIO WITH NAVIGATION AM/FM Navigation System CD Player AM/FM Stereo Bluetooth Connection MP3 Player VISORS, DRIVER AND FRONT PASSENGER ILLUMINATED VANITY MIRRORS Driver Vanity Mirror Passenger Vanity Mirror Passenger Illuminated Visor Mirror Driver Illuminated Vanity Mirror SEATS, FRONT BUCKET WITH RECLINING SEATBACKS AND ADJUSTABLE HEAD RESTRAINTS Bucket Seats ENGINE, 2.0L TURBO DIESEL DOHC L4 (STD) 4 Cylinder Engine Diesel Fuel Turbocharged MIRROR, INSIDE REARVIEW AUTO-DIMMING Auto-Dimming Rearview Mirror *Note - For third party subscriptions or services, please contact the dealer for more information. * Only the CARFAX Buyback Guarantee can offer you the comfort of knowing you made the right purchase. The best part about this well-maintained vehicle is that it is a CARFAX one-owner vehicle. This vehicle has surpassed all inspections to achieve Certified Pre-Owned status. The 2014 Chevrolet offers compelling fuel-efficiency along with great value. You will no longer feel the need to repeatedly fill up this Chevrolet Cruze Diesel's gas tank, in part because of it's superb EPA rating. This vehicle has extremely low mileage on the odometer, so while it's pre-owned, it's practically new. Added comfort with contemporary style is the leather interior to heighten the quality and craftsmanship for the Chevrolet Cruze The best part about navigation systems like the one that comes in this car? You don't have to try to fold them up and stuff them back into the glove box. Previous service records are included, making this Chevrolet Cruze extra special. The interior of this Chevrolet Cruze Diesel has been through meticulous inspection and could almost pass for a brand new vehicle. The Chevrolet CRUZE looks compact on the outside but is full of features on the inside that make it a driving favorite. Outfitted with a modern 4-cylinder turbocharged ECOTEC engine and six-speed manual or available automatic transmission, the Cruze drives smoothly and has both power and fuel efficiency. Choose the Cruze Turbo Diesel and take advantage of performance and efficiency that diesel provides. Safety features include Anti-Lock Brakes, a full ten airbags, electronic stability control, traction control, and the basic design features you see in larger vehicles. You can also take technology to the max with available Bluetooth, steering wheel audio control, and available OnStar. USB port and satellite radio cabability comes standard, and some trims include the touch-screen Chevrolet MyLink entertainment system onboard. Visit us for more information about all the features packed into this fuel efficient and fun to drive package! As always, our goal here at KARL Chevrolet is to assist you to find the perfect vehicle to meet your needs. While we strive to have the area's best selection of quality pre-owned vehicles in stock at all times, we know there are times when a customer may have very specific needs. If you have a specific model or features that you are searching for, please let us know. You might be surprised how quickly we can find a match! Just another KARL Advantage .... finding you the perfect vehicle at the best overall value. Thank you for the opportunity to assist in your vehicle search.